Is sales something you’re born with? Is sales something you’re born with? Is it something you can learn? And I think the perspective you take in this book is very much, I am quoting here you say you can take someone who is untrained, otherwise someone ordinary, sort of an average person who is starting in sales and transform them into someone of in your words – notable superiority. And so this idea includes a number of best practices and or secrets if you will to do that, is that still inaccurate representation? He starts out by telling us, "Well, every salesman did during my time period; reading a few books about selling then having no knowledge whatsoever and developing my own style. And what I discovered was it was fine but it worked for me and not for the people that I was trying to turn into salesman when I became a sales manager. And that involved me moving into developing a format that anyone could use rather than just the what you think of as the born salesman. So if you take someone who has very little charisma, they can be turned into a great salesman." Matt covered, "On one hand I think there’s a lot of great new intelligence and understanding of how sales operates in an increasingly complex world but on the other hand we are still people selling to people and I think some of the fundamentals of selling from Dale Carnegie, from Zig Ziglar can sometimes get lost. Are there any best practices or advice you would give people the sort of balance those two approaches, sort of the traditional with the new?" Ron says, "Well those particular complications dealt heavily with how to develop yourselves to be the kind of person that people want to deal with. It’s referred to as a halo effect. If you are a really attractive person, in some ways that means you’re also honest and forthright so somebody you should deal with." You'll have to listen to the episode for the full story and insights. 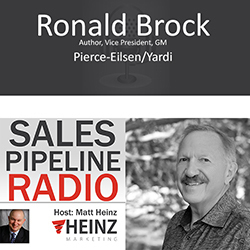 Ronald Brock is the author of the book Gamebreaker: A guide to world-class selling. You can find it on Amazon.com you can also check it out and learn more about Ron at www.gamebreakerbook.com.